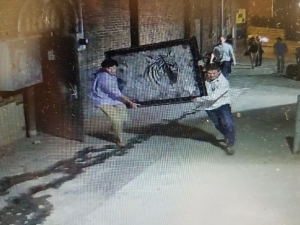 Silverball Bar, 122 S. Ninth St., reported a theft of a large tiger painting and two lighted signs from the business. Video surveillance turned over to CPD has these two as possible suspects. If you have any information on the identity or whereabouts of these individuals, please contact CrimeStoppers at (573) 875-8477.